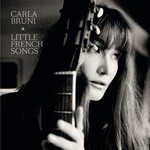 Carla Bruni's fourth album, Little French Songs, written and performed in French, English and Italian, is the follow up to Carla's 2008 critically acclaimed Comme si de rien n'etait (As if Nothing Had Happened). Bruni's touch is immediately apparent in these new compositions that once again focus on raw emotions and love. Little French Songs was recorded by Bénédicte Schmitt at Labomatic Studios in Paris and it features eight original compositions by Carla Bruni. Album track, "Priere" was co-written by Carla and longtime friend and collaborator Julien Clerc. "Dolce Francia" is an Italian adaptation of Charles Trenet's "Douce France" and "Valse Posthume" is written by Chopin, with lyrics written by Carla Bruni.